My first tattoo was the name “XAVIER” on the back of my neck. I got it on my 18th birthday. Growing up, I was always fascinated with the name and thought it was kind of cool. Once I made a connection to the X-Men (in the comics, Professor X’s real name is “Charles Franciz Xavier”), I was obsessed. Tell us about some of your favorites. My sugar skull is always the one that catches people’s eye first. It was a collaborative effort between the artist and me. I got it to honor my heritage. I was never close to the Mexican side of my family, so this was kind of a way to connect with that part of my identity on some deeper level. At the time I had it done, I was in a really dark place and what was initially supposed to cover up another tattoo ended up going on my chest. It served its purpose for awhile as really great artwork to deflect the pain and suffering I was really going through. In time, it made me smile as a reminder of who I am and where I came from. Amazing. What other ones do you love most? The next most visible one is the SoulCycle wheel on my right arm. I never imagined that I would have a career in fitness. I grew up overweight and constantly struggled with fitting in and just finding my place and role in society. When I started riding, I was in a really toxic relationship and couldn’t find a way out. I struggled with making certain decisions and choices even though I knew they were the right ones. Taking SoulCycle classes helped me find my strength and the courage to leave all that craziness behind and enter a new chapter. When I auditioned to become an instructor, I did it with the intention to be able to offer that same healing space and love that was offered to me when I needed it the most. 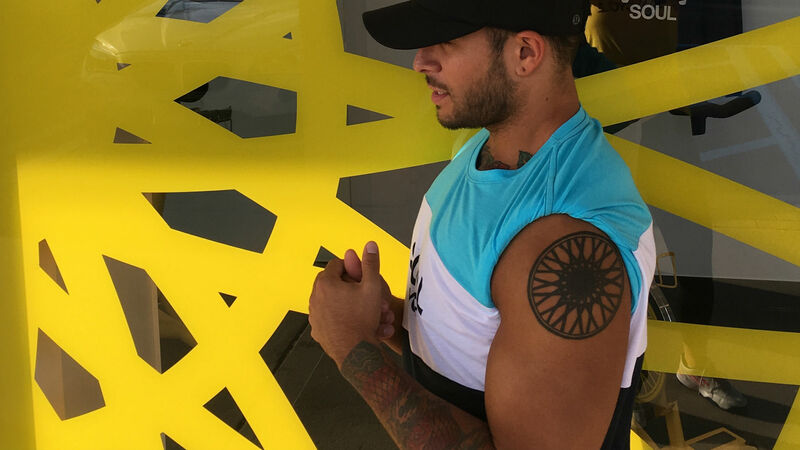 As a reminder of what SoulCycle has done for me, I had the wheel tattooed on my shoulder during my first month of teaching. Awesome. And what’s the one behind your ear? I have “13” on the back of my right ear. I got it on Friday the 13th one year while I was working behind the chair at a salon with a client of mine. The client told me if you get “13” tattooed on you, it reverses your luck and at the time I got it, I wasn’t really having the best of luck in life. I figured it couldn’t hurt. Since getting the tattoo, I’ve learned the number 13 means something to many people – I often get approached and asked about what it means to me. I’ll say "nope" and they will continue to tell me how it was the day of the month of their father’s birth, or their mother’s favorite number or even their lucky number or anniversary date. I don’t know about luck, but the quickest and cheapest tattoo I have ever gotten has ended up being the best conversation starter! If you were to get another one, what would it be? I was thumbing through an adult coloring book and found an amazing piece that I am preparing to have done. I just need to find the right artist to work with on it. I don’t have one. I love all artists and what they add to people’s lives. I love what each one of the artists I’ve worked with has added to my life. My tattoos are my blanket. I love them and I can’t imagine who I’d be without them. People always ask me if they having a deeper meaning, and the answer is always no. It’s more than that; I remember where I was and how I felt when I got each one done. With the exception of the wheel on my shoulder, I was in a really dark place for most of them. I always honor and acknowledge my past, as it made me who I am today. My tattoos are memories and reminders of what I’ve been through.